This transmission electron microscope image shows a cross section through a single Micromonas alga. 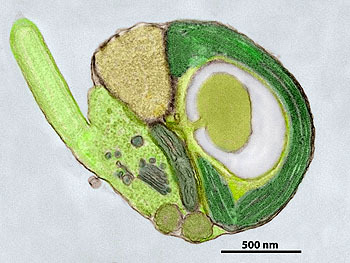 In this “colorized” image, the alga’s chloroplast (photosynthetic organelle) wraps around the right side of the cell and is indicated in dark green. The white area is a starch granule contained within the chloroplast. The tan area at upper left is the cell’s nucleus. The dark green area just below the nucleus is its mitochondrion. Emerging from the left side of the alga is part of it’s flagellum, a hair-like appendage that propels the alga through water. The black bar is 500 nanometers (1/50,000 inch) long. By sequencing the DNA of two tiny marine algae, a team of scientists has opened up a myriad of possibilities for new research in algal physiology, plant biology, and marine ecology. The project was led by Alexandra Worden at the Monterey Bay Aquarium Research Institute (MBARI) and the Joint Genome Institute (JGI). The genome analyses involved a collaborative effort between MBARI, JGI, and an international consortium of scientists from multiple institutions, including University of Washington, Ghent University (Belgium), and Washington University in St. Louis. Initial discoveries from the research appear in the April 10, 2009 edition of Science magazine. Biologists generally agree that all land plants, from tiny mosses to giant redwoods, evolved from an ancestral green alga. Some of the closest representatives of these ancestral green algae living today are thought to be the Prasinophytes, a group of microscopic green algae found across the world’s oceans. Microbial oceanographer Alexandra Worden led a team of scientists that sequenced the genomes of two Prasinophytes in the genus Micromonas. Each Micromonas cell is only about one fiftieth the width of a human hair. However, they are widespread and may serve as important links in marine food webs. They may also influence the amount of carbon dioxide the oceans take up from the atmosphere. Worden’s team spent four years compiling a complete list of the approximately 21 million chemical building blocks (called bases) that make up Micromonas’ DNA. The recent Science paper highlights key aspects of this genetic “Morse code.” The paper also compares Micromonas’ genes with genes found in other organisms. A microscopic alga with leaves? Worden and her fellow researchers discovered that Micromonas carries a significant number of genes that are not found in the genomes of other green algae (at least not in the five or six other species sequenced to date). Some of these genes, however, are found in land plants or bacteria. Worden’s team is currently trying to find out the functions of these genes in Micromonas. Such information will help researchers better understand how Micromonas interacts with its environment and with other marine organisms. For example, the researchers found evidence that Micromonas has genes that scientists previously temporally associated with the development of leafy plants. Obviously, Micromonas never developed leaves. Thus Worden’s research suggests that such genes may have other functions that are not yet understood. Sequencing the genomes of two small marine algae may not seem to have many real-life benefits. But when you consider that these organisms share genes with other microbes and suites of genes with land plants, the possibilities are virtually endless. Worden and her team are looking forward to further exploration of the “toolbox” of genes used by the multitude of organisms that keep our planet green.